‘Welcome to a day inside the town that time forgot…’ goes the first line in the new musical I’m writing called The State of Things. As the title suggests, the show is about just that. I grew up in a small canal town in the Midlands and, for as long as I can recall, knew I wanted to go into music and theatre. I’m lucky to have parents who were willing to ferry me around to rehearsals and, of course, scrape together enough money to fund my hobby. But supportive parents are not the only thing needed to succeed, and as our feeble government seems intent on powering through with its failed austerity vision for the country, arts spending in schools was one of the first things to be guillotined. During my time at school I saw first-hand how these cutbacks hit our music and drama departments the hardest. Redundancies were commonplace, our two extracurricular orchestras were disbanded, student numbers opting to take music at GCSE and A-Level plummeted and, eventually, some creative courses weren’t offered to Sixth Form students at all. Despite the proven socio-economic benefits of investment in the arts, we always seem to see them suffer under Conservative governments. So, now, five years after leaving high school, my best friend Thomas Attwood and I have written a brand new rock musical about our experiences growing up, and our encounters with Austerity Britain both in school and at home. The show follows a school band and their fight against the system after they discover their music course is being cut. It’s a story of rebellion against authority, the awkwardness of being teenagers and the struggles that young people and their families face when the welfare state is no longer there to support them. If you’re a musical theatre fan then, great, this is definitely for you. If you’re not, then don’t despair, this is far from your traditional ‘song and dance’ show! We have a talented cast in a live rock band playing songs that sound more like an iTunes playlist than Andrew Lloyd Webber, and a story packed full of laughter, heartbreak and swearing (sorry, Mum). With the resurgence of populism in leftist policies and for, arguably, the first time a huge increase in political activism from young people, I hope the show can become a battle cry for anyone who’s ever felt excluded from the elitist politics that serve only to help the few, not the many. No matter where you sit on the political spectrum we’d love to see you at the premiere of The State of Things and hear our story about an age, class and subject matter that is too often left behind. 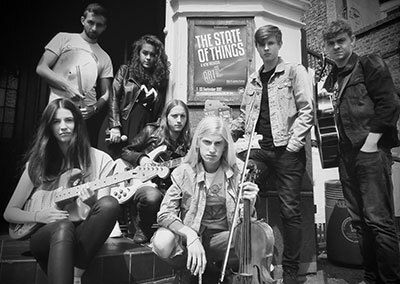 The State of Things runs from 7-23 September at the Jack Studio Theatre, in south east London. More info and tickets. Edd Mustill reviews The World of Extreme Happiness at London's National Theatre Shed.